The Daily Rundown's Chuck Todd talks about the heavy campaigning in the Buckeye State and why it's important to the 2012 election. Focusing on Ohio -- and Colorado… New NBC/WSJ/Marist polls show Obama and Romney tied in Colorado at 48% and Obama up 50%-47% in Nevada… Ohio’s proxy battle: Brown vs. Mandel… Talk about an October surprise: Here comes Hurricane Sandy… Sununu: Powell endorsed Obama because of race… And the battle for perceived momentum. The latest NBC News/WSJ poll shows a tie in Colorado between Mitt Romney and President Obama and Obama maintaining a slight lead in Nevada. But how much will the female vote impact the election? And will Ohio continue to stay in the president's favor? Can Romney turn that state around? "Meet the Press" moderator David Gregory and NBC News' Chuck Todd discuss. 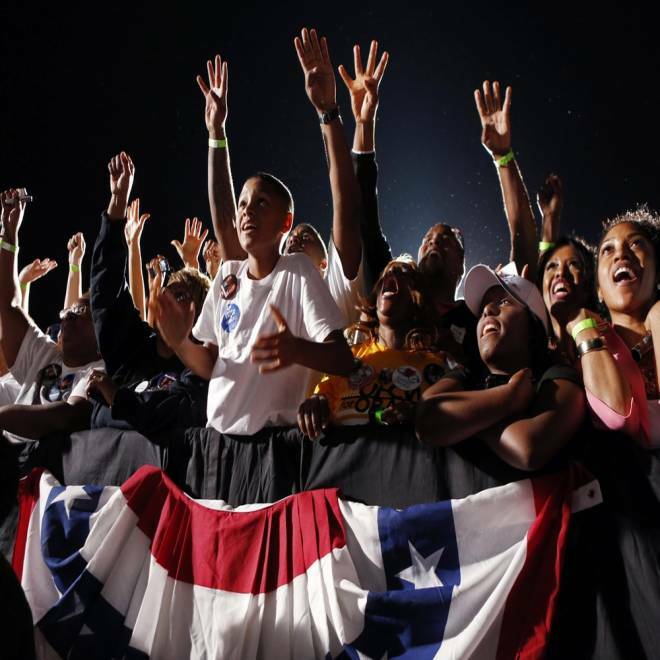 A boy cheers while others chant "Four more years" as President Barack Obama speaks at a campaign rally in Cleveland, Ohio October 25, 2012. Obama is on a two-day, eight-state, campaign swing. *** Ohio’s proxy battle: If we learned anything from last night’s Sherrod Brown-vs.-Josh Mandel debate here in Cincinnati, which one of us moderated, it’s that the race is essentially a proxy for the presidential contest on Ohio. You had Brown touting the auto bailout, an improving economy, and balanced deficit reduction, while Mandel was casting himself as a change agent, campaigning against Washington, and opposing any kind of tax increases. The one big exception was Mandel not saying if he would vote for the Ryan budget plan. Most Republicans, including Romney, have embraced that plan. And although Romney has tried to blur his opposition to the auto bailout -- NBC’s Garrett Haake wrote last night that surrogate Rob Portman told Romney’s audience that the GOP presidential nominee had proposed government guarantees (but that was only after bankruptcy) -- Mandel simply said he opposed it because it cut pension benefits for some 5,000 Delphi retirees, and he made the original case Romney had made against the bailout that it was unnecessary because a private bankruptcy could have worked. While Romney has tried to alter his answer a tad, Mandel did not. NBC's Chuck Todd and David Gregory weigh in on the candidates' closing arguments as the presidential race comes down to the wire. Their messages: Mitt Romney promises change while President Obama argues for trust. *** Talk about an October surprise: After weather disrupted both the GOP and Democratic conventions over the summer, Mother Nature appears to have one more surprise in store for the two campaigns: Hurricane Sandy. With that storm approaching the East Coast, it raises a host of questions. What happens to Obama’s events with Bill Clinton on Monday in Florida and Virginia? Does it snow in the Midwest, where both Obama and Romney are set to campaign later next week? Does the hurricane even hit Romney’s campaign headquarters in Boston? These are a lot of questions, but we don’t have any answers. This puts a MAJOR wrench into the final week of travel plans for both campaigns; And of course, how the government responds will get extra scrutiny and, well, ya never know. Now we have our October surprise. *** Romney camp walks back Sununu’s comment: Late last night, per NBC’s Peter Alexander, the Romney camp released this statement from Sununu: "Colin Powell is a friend and I respect the endorsement decision he made and I do not doubt that it was based on anything but his support of the president's policies. Piers Morgan's question was whether Colin Powell should leave the party, and I don't think he should." (But when you see the interview, Sununu clearly questioned whether Powell’s endorsement was based on issues and policies. Honest question: If this was the statement the Romney camp was going to send, would they have been better off sending nothing? ) This, of course, isn’t the first time that Sununu words have sparked controversy -- and caused some Obama supporters to accuse him of dog whistling on race.. He earlier said he wished Obama "would learn to be an American," and called Obama “lazy” after the first debate. This is a Romney national campaign co-chair; this isn’t simply some unknown supporter. The last thing the Romney campaign wants to introduce is the idea that endorsements are based on race. Did Ross Perot back Romney because he’s white? What would the outrage have been had some Obama national campaign co-chair insinuated that? *** The battle for perceived momentum: So what’s going on in Minnesota? Is the Romney campaign buying TV ad time there to create a narrative that the map is expanding? Do they really think they have a chance in Minnesota, or do they just have money to burn? If they were serious about expanding the map, wouldn’t they be putting this money in Pennsylvania? Just a few questions worth asking and thinking about. *** On the trail: Obama is off the trail, but he conducts a series of interviews, including with MTV’s Sway Calloway, radio host Michel Smerconish, and Urban Radio’s April Ryan… Romney delivers an economic speech in Ames, IA at 1:10 pm ET and then hits a rally with Paul Ryan in Canton, OH at 7:15 pm ET… Biden stumps in Wisconsin… And Michelle Obama is in Las Vegas, while Ann Romney is in Virginia Beach, VA.
*** On the trail over the weekend: On Saturday, Obama holds a rally in Nashua, NH… Romney stumps with Marco Rubio in Florida… Biden hits Virginia… Ryan begins a bus tour through Ohio… And on Sunday, Romney holds three rallies in Virginia.